PREMIUM PORTABLE GRINDER - Precision milled 4-part grinder made from high quality aluminium with a super slim, non-stick nylon O-ring for silky smooth grinding. The 100% CNC machined pieces fit perfectly together and nylon ring prevents metal-to-metal contact when grinding, preventing residue build up and sticking unlike other cheaper grinders. GREAT GRIND EVERY TIME! - 54 razor sharp teeth cut and fluff your herb, our grinders ensure an amazing grind everytime. Perfectly sized and holes ensure that only fully grinded material falls through to the holding chamber below -- vital to getting the most out of your grinding experience. 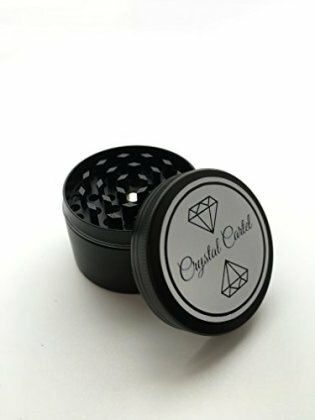 PORTABILITY - At 50mm these grinders are the perfect size for everyday use and portablility. The magnetic lid is held tightly closed by two strong magnets to ensure no spills while on the move. MICRON SCREEN AND SCRAPER - A micron screen holds ultra fine particles in the third chamber and a scraper tool is included for cleaning to ensure nothing is left behind. 100% SATISFACTION GUARANTEE! - If you aren't happy with your purchase, please let us know and give us a chance to address your concerns. DISCREET PACKAGING - Our grinders ship in a plain cardboard outer box with no reference to the contents.